On Wednesday 15 July 2015 the Northern Territory Archives Centre hosted the second of its WWI Centenary of ANZAC talks presented by Dr Matthew Stephen, historian and Manager of the Oral History unit at the Northern Territory Archives Service. World War I provided the context for sports 'entertainment' and team sports which had not existed previously in Darwin. The establishment of Vesteys Meatworks at Bullocky Point from 1914 introduced a large male workforce to the town. These people had time and money on their hands, resulting in a 'boom' in sporting activity. 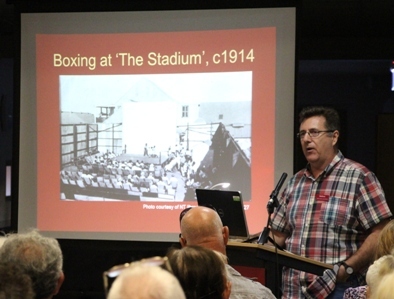 In his talk, Dr Stephen gave an insight into the sporting activity and founding of the game of Australian Rules football from this time, and discussed the place this code of football has taken in Northern Territory identity and culture. Listen to the audio recording (13.4 mb) of Dr Stephen's talk. Read Dr Stephen's presentation (7.3 mb). For more research on World War I or sport in the Northern Territory, contact reference staff at the Northern Territory Archives Centre. Matthew completed his PhD at Darwin's Charles Darwin University in 2009, researching the topic of Sport and Race in The Northern Territory, during the period 1869–1953. In 2011 he undertook museum studies in the conservation of photographs in the museum environment. Matthew's ongoing research into Northern Territory history has a particular focus on oral history and photography, and exploring why some stories are 'often told' while others are 'forgotten'. These themes are central to his new book 'Colour Bar: Remembering and Forgetting Northern Territory Football 1916 to 1955'.